Mitus 206la arrays chosen for meeting the unique challenges that come with servicing corporate clients and tricky venues. As a company that does live sound, installations and corporate events for notable clients, Myers Concert Productions (Murfreesboro, TN) has a variety of sound systems at its disposal. Recently, however, DJ Myers, owner, confided that he’s been increasingly working FBT loudspeakers into his touring and corporate inventory. 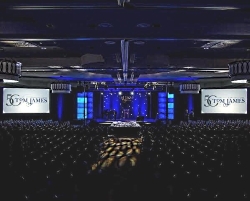 While he lists cost and sound quality as two reasons for this change, he also says FBT’s Mitus 206la’s are exceptional at meeting the unique challenges that come with servicing corporate clients and tricky venues.